The RTI Dose Probe is an external dose probe, designed to perform very low dose rate measurements for instance on image intensifiers. To avoid or minimize interference with AEC (Automatic Exposure Control) on X-ray equipment, the probe is very small. This also enables to fit it into the table bucky. Since it is a solid-state detector, no corrections for pressure or temperature are needed. Neither is bias voltage. The RTI Dose Probe is small and has a fast response which makes it ideal for pulsed fluroscopy. It can detect the individual pulses, determine pulse rate and show waveforms even at the highest pulse rates used on modern fluoroscopy systems and be used both for continuous and pulsed fluroroscopy. This is not possible with ionization chambers since their response is too slow to resolve individual pulses. 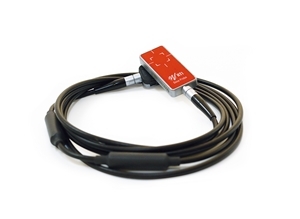 The RTI Dose Probe supports the ADI (automatic detector identification) system. When connected, the Piranha or Cobia automatically identifies the probe and makes all necessary adjustments without any need for interaction from the user. The Piranha ADI system also gives full interchangeability of probes between different Piranha systems using the same type of probes. With the extra ordinary sensitivity of the Dose Probe it is even suitable for scatter and leakage measurements.